The Lib Dems appear to be embarked on a deliberate campaign of misinformation about the Greens - presumably out of fear as to how well we might do on June 4th. They have made misleading claims about the way the voting system works for the European elections, highly-misleading claims about previous election results (they are using general election results presented in a biased way typically), plain false claims about our EU policy position; and overall it is an attempt to suggest the "Greens cannot win", whereas of course we certainly can win, and it's looking likely that we may well do so in just a few days time. The latest polls give us enough support to win with, here in Eastern. If you see Lib Dem leaflets or letters along these lines locally, please do get in touch with me so we can get a better picture of what they are doing. Given that we are currently at our strongest position in the polls for 20 years, it looks unlikely that the Lib Dems will achieve what they are trying to do but it is nevetheless important that we give the voters the truth about our policies and the voting system and take every opportunity to do so in the last few days of the campaign. The upcoming European elections are being seen as a referendum on the future of British politics. On May 29th I made the Green Party's case for the future at the proposed wind-farm site in Bedfordshire featured in the fore-thinking Academy Award nominated film The Age of Stupid. Set in a future world ravaged by climate change, the film’s solitary narrator asks why previous generations failed to take the steps—like developing alternative energy sources—to forestall it. I addressed that question on Friday. "The global consensus has finally come round to the view Greens have held all along but more importantly, the economic conditions have finally caught up as well. It simply doesn’t make sense to go on in the same way, inching toward ineffective carbon reduction targets when a more wholehearted shift would translate into millions of high-quality, skilled jobs that are virtually recession proof." Building sustainable alternative energy sources like wind, tidal, and solar power are a key part of the Party’s European Election Manifesto, which I co-authored, that lays out a plan to create 1 million new jobs throughout Britain, up to 100,000 of these coming in East Region. These policies are more prescient coming at a time when Kofi Annan's Global Humanitarian Forum shows that climate change 'is already responsible for 300,000 deaths a year and is affecting 300m people'. The study goes on to say that climate change could amount in $600bn of economic losses by 2030. Where Will The Protest Vote Go? The UK political media has been dominated by the row over MPs' expenses - and speculation as to how the voters might show their disgust on polling day next week. Today Rupert Read, the Green Party's leading Euro-candidate in Eastern region, called for voters to make a positive choice on 4th June, and "vote for the only party in this campaign bold enough to set out a positive vision." Speaking from his campaign tour of the Eastern region, Dr Read said: "As we move towards the end of the European election campaign, there's one emerging story that the media is only now becoming aware of. Whilst political corruption, voter disillusionment and the threat of the BNP have been the main stories up to this point, quietly under the surface the Green Party has been steadily gaining support." * A UKIP/ComRes poll that put the Greens on 11% nationwide, easily enough to win seats in several more English regions. The poll put the Greens on 16% in the South East, which would give a seat to Brighton councillor Keith Taylor as well as party leader Caroline Lucas MEP. * A _Guardian_/ICM poll that put the Greens on 9%, half as much again as in 2004 - with UKIP on 10%, down from 16% in 2004, and the BNP on just 1%, down from 5% last time. * A Green Party/YouGov poll in which 34% said they would either definitely vote Green in the Euro-elections, or would consider voting Green if they knew more about the party. * 45% thought Labour, and 40% Conservative, would put their pockets before their country. * Next came the BNP, the LibDems and UKIP, on 20%, 16% and 15% respectively. * Only 5% thought Green politicians would put their own interests before their country's. Dr Read commented: "There has, of course, been intense speculation in the media that the protest vote would go to the BNP. Even the BBC has repeatedly, nay doggedly, mentioned the BNP as the possible beneficiary of the anti-sleaze protest, despite the contrary evidence of the opinion polls. Perhaps the latest YouGov poll, suggesting that the public feels BNP politicians are even more likely than UKIP to put their own financial interests before their country's, might help pop the bubble of hysteria." And he concluded: "I think it will be far better for Britain if the majority of those minor party seats are taken up by Greens, committed to working hard for that million-jobs Green New Deal, with a positive vision for reform of both European and British democracy." A recent survey of healthcare workers in the East of England conducted by the Green Party, has found that Green Party health policies are in line with many of the views expressed, particularly on many key points of principle, such as the price of healthcare provision and privatisation. The Tories, Labour and Lib Dems all support further privatisation in the NHS. This is far out of line with the opinions of the real people surveyed who are working in healthcare. The Green Party found that 70% of respondents agreed (‘agreed’ or ‘strongly agreed’) with the statement ‘further privatisation in the NHS should be avoided’. And 73% of respondents believed the use of private cleaning companies for NHS contracts may increase the risks of infections like MRSA on hospital wards and should be avoided. The Royal College of Nursing and the Green Party both agree, while the Tories, Labour and Lib Dems oppose any re-nationalisation of cleaning services in the NHS. “Greens have always recognised that the privatisation of the NHS is incompatible with democratic accountability and with well-run hospitals. The failure of New Labour’s Public Private Partnerships, which so often delivers poorer service and can run over budget, is a clear example of these problems. The Green Party survey found that 83% of respondents agreed with the statement ‘a greater role in health provision should be afforded to local health centres, as opposed to very large regional hospitals’. The Green Party is the only party committed to a program of genuine ‘relocalisation’ and decentralization of public services in the name of accountability and local choice. 77% of respondents agreed that healthcare should always be free to the consumer at the point of delivery. The Lib Dems merely say they would ‘review’ prescription charges if they came to power and Labour and the Tories continue to support charges. The Green Party on the other hand, opposes on principle all charging for health except through the taxation system - a genuine position of principle that healthcare should be "free at the point of need". Respondents to the Green party survey were unanimous in agreeing that complementary medicine should be provided on the NHS if there was evidence that it worked. The Greens Party agrees that complementary medicine should be provided when appropriate. 63% of respondents agreed with a central Green policy advocating increasing the amount of money spent on prevention of health problems and on health promotion schemes. And a majority agreed (and only 6% disagreed) that the public have a right to assisted dying in very tightly controlled and assessed situations where a patient has a terminal illness and has requested assistance. The Green Party recognizes the complex moral and personal issues surrounding this issue but believes that, under very specific and strict conditions, a person should have a right to end their life with dignity rather than in severe pain. Green Party MEPs Jean Lambert and Caroline Lucas scored top marks for their voting record on animal issues in Europe in an analysis by PAD Director Dr Dan Lyons. The Green MEPs both got a perfect score of +15 from the award-winning political analyst, while Andrew Duff, Lib Dem MEP for the Eastern Region came bottom with a paltry -15...the lowest score possible. The UK Greens are the only party which has a policy called 'animal rights'. Both Green MEPs, Caroline Lucas in South East England and Jean Lambert in London, are staunch and consistent defenders of animals with a 100% positive record on this vote, both scoring +15. Dr Lucas has been especially active for animals and helps to table pro-animal laws. The Green group is now an influential force in the European Parliament, and UK Greens can rally their colleagues to help make a major difference for animals. The Euro manifesto includes a specific animal protection section and promises to work for a ban on animal experiments. Andrew Duff, MEP for the Eastern region of England, earned his rather evil minus 15 due to his cosy relationship with the animal testing industry. As a whole the Lib Dems are a little inconsistent and unreliable on animal welfare issues and their Euro manifesto doesn't mention animals at all. The Greens have an excellent chance of winning seats in Eastern England, and with the latest polls showing the Greens only 2 points behind the Lib Dems, a vote for the Green Party would be a huge vote for animal rights and a massive one against the animal testing industry and their big supporter, Lib Dem MEP Andrew Duff. On Tour in Watford, Luton and St Albans with the Big Green Bus! Green politicians are the "most trusted to put Britain before self"
A YouGov poll to be published this week (1) suggests the British public trusts Green politicians far more than those of other parties. Over 2,000 people were asked - regardless of the party they normally voted for - which party's politicians they thought were most likely to put their own financial interests before the interests of their country. Allowed to choose three parties, only 5% named the Greens as likely to put self-interest before the country's. Labour appeared to be the least trusted, with 45% of respondents naming Labour politicians as likely to put financial self-interest before their country. The Conservatives were almost as bad, with 40% naming them. Next were the BNP, the LibDems and UKIP on 20%, 16% and 15% respectively. The new poll was released in the same week that campaign group Open Europe rated the Green Party's leader Caroline Lucas as the joint best British MEP on accountability, transparency and reform. The bottom nine places in the Open Europe survey were occupied by four Conservatives and five UKIP MEPs - with the tenth-worst British MEP slot being held jointly by UKIP leader Nigel Farage and an MEP each from Labour, the Conservatives and the LibDems. The Greens say that while there's much talk of an anti-sleaze protest vote going to the racist BNP, in fact the opinion polls are showing the Green Party to be a far more likely recipient of any protest vote. The ComRes poll of 17 May, commissioned by UKIP, put the Greens on 11% and the BNP on just 4%. The ComRes poll put the Greens on 13% across Northern England - easily enough for Green candidate Peter Cranie to defeat BNP leader Nick Griffin in the North West contest. The ComRes poll showed the Greens in third place in the South East, ready to return party leader Caroline Lucas MEP and scoop up a second seat for Brighton councillor Keith Taylor. The next day a YouGov poll commissioned by the Green Party suggested 34% would either definitely vote Green or would consider voting Green in the Euro-elections. And the Guardian/ICM poll of 22 May put the Greens on 9% - just behind UKIP (10%) but way ahead of the BNP (1%). The Guardian/ICM poll showed a Green increase of 50% compared with the actual 2004 vote (up from 6% to 9%) while UKIP was down 60% (from 16% to 10%) and the BNP vote was cut by about four-fifths (down from 5% to 1%). 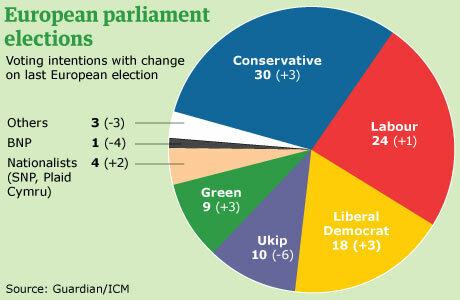 The Greens point out that polls ahead of Euro-elections usually under-estimate the Green Party. In 1989 the Greens were showing in the polls at about 7-8% but their actual vote turned out to be 15%. The Greens believe their million-jobs manifesto for tackling the recession and the climate crisis at the same time has probably struck a chord with a lot of people. 1. Poll commissioned by the Green Party and conducted by YouGov. Fieldwork 13-15 May 2009. Sample size 2,111. The exact question was: "Regardless of the party you usually vote for, which party's politicians do you think are most likely to put their own financial interests ahead of the interests of the country? [Please tick up to three.]" 2. Further information from Spencer Fitz-Gibbon, 0161 225 4863, 07973 736351. From Green Party press office, 020 7561 0282. Published and promoted by Spencer Fitz-Gibbon for the Green Party of England & Wales, both at 1a Waterlow Road, London N19 5NJ. Green Party Lead MEP Candidate for the Eastern Region, Cllr. 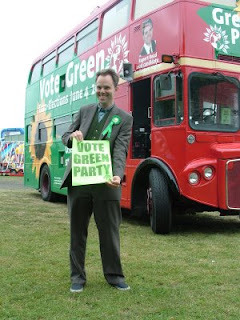 Rupert Read, brought his party's Big Green Bus-a converted routemaster touring bus that now runs on a mix of recycled cooking oil and bio diesel fuel-to Hertfordshire on Wednesday, 27 May, to promote the Green Party's European Election manifesto. The bus could be heard rolling through the towns of Harlow, Ware, and Hertford, it's PA system projecting details of the Party's plan to create 100,000 new jobs in sustainable energy, energy conservation, and transport as part of its 'Green New Deal'. The bus tour, which passed through Essex on Tuesday and visits Bedfordshire on Thursday, is another element of a ramped up campaign strategy aimed at taking advantage of the recent surge of support many polls show them to enjoy. Several of the Party's MEP candidates have joined county council candidates to highlight the likelihood that, with continued support, the Greens will achieve the 10% of the popular vote needed under the proportional representation system to secure the East Region its first Green MEP. Please contace Matt Lavery, who is on tour with the bus through the 28th, with any questions. He can be reaced on 07731 648961, or via e-mail (mattlav10@gmail.com) at the end of each day. With the Euro elections less than a fortnight away, a survey by the independent think tank, Open Europe, has ranked Caroline in joint first place on transparency and reform. UKIP's MEPs filled FIVE of the bottom 9 places amongst UK MEPs. All 785 MEPs were given scores for their records over the last five year term - including scrutiny of their expenses. Marks were given in 20 categories including voting records, attendance, written declarations, and a failed attempt to get taxpayers to top up their pension contributions. Open Europe monitored a range of MEPs' activities, including voting records, written declarations, and whether MEPs opposed "wasteful activities". Caroline Lucas scored 43 points, along with two Scottish MEPs, putting them in joint tenth place out of 785 MEPs and at the top of the UK table. A Swedish Green MEP, Carl Schlyter, won the most points - 55 out of a possible 58 and the far-right Italian MEP Roberto Fiore came bottom scoring just 2 points. 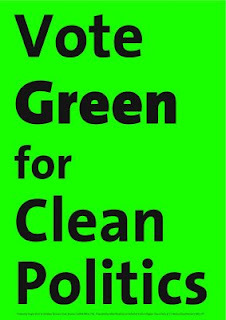 "shows more clearly than ever that if people want to see greater democracy, transparency and accountability in parliament, the best way of achieving that is to vote Green on 4 June." "They might talk a good game at home, but too many British MEPs have voted against transparency and EU reform on a number of occasions. What we need now is a new generation of politicians, committed to acting in the public interest and pushing for a much better deal for taxpayers at all levels of government - including EU level." The Green Party’s lead candidate for the East of England in next month’s European elections, Dr Rupert Read, will be giving his backing to a long delayed windfarm when he visits the proposed site on Friday May 29th. The planning battle over the development at Airfield Farm, Podington, next to the Santa Pod drag-racing track in Bedfordshire, is documented as one of the real-life stories in the new feature film “The Age of Stupid”. The film stars Pete Postlethwaite as “The Archivist”, who looks back in time from a ravaged planet Earth in 2055 asking why we didn’t stop climate change when we had the chance. The film documents objections to the original proposal for nine turbines at Airfield Farm, a proposal rejected by planners in 2007 after a campaign by local people. Now the developers, Nuon Renewables, have submitted a revised plan for three turbines producing enough clean energy for three thousand homes. This application is currently being processed by Bedford Borough Council. Dr Read will visit Airfield Farm with Demelza Stevenson, who will explain how the company’s plans have been modified to take account of earlier objections so that the scheme can go forward. Rupert Read is a wholehearted supporter of the development. One of his stated aims if elected as the East of England’s first Green MEP on June 4th would be to work to turn the region into a hub for the development of renewable energy of all kinds, including wind, tidal and solar power as the best way to stave off the damaging effects of man-made climate change, so graphically illustrated in “The Age of Stupid”. "When projects like this get the green light, it's a great thing: that's what we need to happen here. That's why I am visiting on the 29th to back this project. Having spent months campaigning on the doorstep, I get a real sense that people want more investment into the creation of green jobs, which projects like this would provide. Now, more than ever, people are looking for job- and energy- security. I hope to be able to continue fighting for those goals as an MEP after June 4th; and I will continue to support projects like Airfield Farm where a better future is being created, on the ground and in the air". Rupert Read will be available for interview at 1030am on Friday May 29th at Airfield Farm, Podington. The East of England Green Party is taking to the road between May 26th and 28th on the Big Green Bus Tour as part of its campaign to win a seat in the European Parliament at the June 4th elections. The bus is a vintage Routemaster fuelled with recycled cooking oil. Green candidates and supporters will be travelling on the bus, with lots of stops planned for campaigning in the towns and villages along the route. The Tour starts at South Ockendon on the morning of Tuesday 26th May, before moving on to Stanford-le-hope. In the afternoon the bus will arrive in Basildon, before moving on to Brentwood and then Epping Forest, where the days events end. On Wednesday 27th May, the first visit is to Epping town centre, followed by multiple stops around Epping Forest.The bus moves on to Harlow at lunchtime, followed by Ware and then Hertford in the afternoon. The days events end at Welwyn Garden City. On Thursday 28th May, the tour restarts from Welwyn Garden City town centre in the morning before moving on to Stevenage. The bus reaches Luton at lunchtime before continuing on to St. Albans. The day, and the tour, ends at Watford. Further details of times and locations available on request. Greens surge forward in ICM poll! There is surely a potential legal case here, should any BNP candidates win on June 4. The Green Party in the East of England is today launching a campaign to show the electorate that they are ready to become the major new player in British politics. The ongoing scandal in Westminster has now claimed Speaker Michael Martin as its most prominent victim, and MPs are lining up to announce their retirement at the next election under clouds of expenses controversy. The Greens offer a fresh and clean alternative at the June 4th elections. In Eastern Region, the Greens are launching a multi-platform media campaign to promote their clean politics reputation to voters ahead of the elections. The latest polls show a surge in support for the Greens which could deliver many more seats than the current 2 MEPs the Greens have had since 1999 (in London and South East regions). If the polls are accurate, Green Lead candidate Rupert Read will become an MEP in just over 2 weeks time. 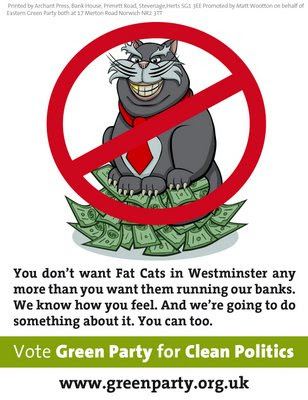 The new Green Party campaign features "The Fat Cat", a cartoon character who is sitting on a big pile of cash. "It has already generated an enormous response", said Rupert Read, lead MEP Candidate from the East. "The Fat Cat reflects public outrage over high-rolling politics as usual. And it underscores by contrast the clean politics alternative that the Greens are promoting. Adding to calls for a root and branch reform of politics, Green Party Leader Dr. Caroline Lucas was interviewed on The Today programme on BBC Radio 4 this morning. She stated that politics could recover and become vibrant again if the voting system was changed and if there was more diversity in parliament (1). BBC2's The Daily Politics (1) has published a survey of parties which currently have MEPs, asking each of them what their current policy is towards their MEP expenses and whether they would publish details. UKIP refused to reveal their expenses and stated "Sorry but we are unable to provide you with a full breakdown of our MEPs expenses. It is not that we do not think they should be published but because quite frankly at present we have neither the time or resources to provide them in the timescale you asked for. When a small party starts fighting a major campaign then everybody is working flat out on that and becomes the only priority." The Green Party did give details (2) on its expenses policy and confirmed that it had already been publishing some expenses details, with more to come as soon as the information can be collated, despite the Greens having less financial resources than UKIP and working flat out in an election period. (3) UKIP MEP Ashley Mote (South East Region) was jailed for benefit fraud and former UKIP MEP Tom Wise (Eastern Region) has been charged with fraud relating to his activities as an MEP. Want to display our Clean Politics poster? Click here to download in pdf format. Don't forget to print it on Green paper! Stand up to MPs’ sleaze. Stand up for clean politics. · MPs should not be allowed to make up the rules that govern their own expenses and communication. There should be an independent commission empowered to oversee and regulate. · There should be comparison with civil servants in how these matters are handled. · It should be a criminal offence to knowingly overclaim - just as it is a criminal offence to knowingly overclaim benefits. They should be paid a flat-rate overnight allowance. The allowance would pay for hotel accommodation, but could instead be used for rent. (While many MPs have behaved outrageously, it's unreasonable to ask a good MP to live out of a suitcase). The allowance should only be paid for the nights that the MP needs to be in the capital. As a possible alternative to the above, we would ask the Kelly committee to consider the possibility of providing MPs who live outside London with apartments in London. But this isn't just about expenses. We have an unfair election system that practically guarantees a minority government  a government more people voted against than voted for. The whole system is dominated by three very similar parties. So instead of active public engagement with politics there is widespread apathy, cynicism and anger. Therefore we need a complete overhaul of British democracy  including a proportional representation election system for all elections, not just for the European Parliament elections. The above rubbish, contained in this leaflet, a laughable farrago of misinformation and poppycock (albeit laced as such farragos often are with a number of truths), is what UKIP MEPs are offering voters to 'inform' them with regard to the most serious threat of our time: manmade climate change. These people are elected Parliamentarians. Shudder, at the thought of more of these dangerous cretins being elected on June 4. Following the surge in support for the Greens reported in recent polls, Rupert Read's bid to become the first ever Green MEP for Eastern Region has received a further boost with the endorsement of high profile figures in public life. The most important boost that the campaign has received however is that former Independent MP Martin Bell is supporting the Greens' Clean Campaign Pledge. Martin Bell was a candidate at the 2004 European elections in Eastern region and is a long standing campaigner for higher standards in public life. "I support the pledge. I believe that especially in the present climate of public disillusionment with so many politicans candidates for the European Parliament should sign up to this pledge or make a similar one themselves." Rupert Read's bid to become an MEP has been personally backed by Craig Murray, the current Rector of the University of Dundee and a former British Ambassador. For example, out of the whole country, in the Euro elections I would vote for Rupert Read in the Eastern Region of England. Rupert is an honest and hard working man with a passionate concern for the environment and for the quality of life in this country. He sees the need for a society not motivated solely by greed. He is that rare thing in modern politics - somebody who wants to serve, not to rule. "I support Rupert Read's campaign to become a Green MEP. He and his party project a version of the future that gives all our children the chance they need in the difficult times that now increasingly face us all." Tony Juniper, former national head of Friends of the Earth joined with Sir Jonathon Porritt, Chair of the Government’s Sustainable Development Commission at the Cambridge launch of the Eastern Region Euro campaign to endorse the Green Party’s / Read’s campaign. I now have a twitter account in support of the upcoming European elections. As you might know, I'm an avid user of twitter, so feel free to follow me and tweet me on www.twitter.com/RupertRead4MEP - I'm eager to hear your thoughts and find out what interests you! And of course I'll follow you back! Are the media ignoring the REAL Green shoots? Are the media ignoring the REAL Green shoots that are now growing fast...? "This ought to be a time of political meltdown. The system that has governed our thinking for at least a generation is literally bankrupt. And we have probably one chance, one window, to assure our survival as a civilisation. A proportional representation election such as that on June 4 offers the chance of course for a sudden radical change in voters' preferences." Indeed recent polling since the expenses scandal broke has shown that the Greens have been reaping the rewards of what the public perceive to be the moral bankruptcy of the main Parliamentary parties. The situation is ever-changing and I make no claims to know what will happen on election day but things are looking very good for the Green Party with polls indicating we may even receive a result rivaling the 15% highpoint of the '89 election. But here's the funny thing, the primary focus of the media, and the BBC in particular, has been on the BNP, a party that appears to be falling far short of its expectations. The BNP are a risk in their key seats, particularly the North West , which is why campaigners have rightly set their minds to combating them but why is the BBC talking up the threat? Those watching the BBC coverage could be forgiven for thinking that the only dynamic here was between the big three and the fascists. It could be that the BBC prefers bad news to good. Perhaps they think that the prospect of fascists gaining an MEP is a sexier news story than a whole new swathe of clean, Green politicians. That might be even true, although I'm understandably excited at the prospect that I may get elected in June. It might be the case that the BBC have a particularly low opinion of the public, believing ,quite wrongly, that just because people are angry they will automatically vote for racists, liars and scumbags. Even if that were the case, which it clearly isn't, why the BBC think it's their job to promote the BNP so relentlessly is beyond me. We're hoping that the public will make a strong statement against a political class increasingly divorced from the electorate both financially and politically, but we hope people will also reject backwards-looking dead-ends like UKIP or the BNP. The irony of an anti-corruption vote going to UKIP has not been lost on many political activists - see e.g. http://public.easterngreenparty.fastmail.fm/Accountability or http://www.timesonline.co.uk/tol/news/politics/article1434608.ece for why - although it is obviously preferable to have a do-nothing UKIPer than a British Nationalist MEP who will actively promote their malign politics. No one has to vote for the fake  patriotism  of the BNP in order to help shake up UK politics but the BBC have already dubbed them the likely main beneficiaries of the sleaze scandal. As yet there is no evidence for this and, as long as anti-fascist campaigners keep up their excellent work, we can ensure the Beeb's dire predictions will not come true, no matter how much they seem to be trying to make it happen. Effectively challenging the top down nature of our democracy and how it relates to the mammoth financial institutions means electing radical and forward thinking politicians who are committed to a different vision than the cozy consensus that exists in Parliament. And anyway, obviously, this election isn't just about stopping the BNP or Parliamentary corruption - although that is the all important backdrop. When we elect MEPs for the next five years they will be called upon to tackle dangerous climate change and the impacts of Peak Oil in the context of an economic collapse. Half-hearted measures from a comfortable elite or backwards xenophobia cannot challenge social inequality and injustice. You can guarantee that Greens aren't careerists – because self serving pocket-liners don't take the hardest route to political advancement. Greens, by definition, are principled and progressive campaigners filled with passion not desire to inflate their bank balances. The BBC and many of our newspapers may think the main story is the BNP and tend to sideline the Greens, but the UK is so much more than just the status quo on one side and angry racists on the other. On June 4th we have an opportunity to show that there are millions of us who make up a movement for democratic change. That would really give the BBC something to talk about. Camp Bling announces 'the end' as road scheme stopped. As a result, campaigners intend to honour their public pledge to clear and vacate the camp, now that their objective to stop the road has been met completely. It is expected that it will take a number of weeks to fully return the East Saxon king's burial to its former condition, with all structures and materials on the site to be removed by the group, with the objective of incurring no cost to the local taxpayer. (3) Climate, Peak Oil, Overpopulation, Mass Extinction, Overconsumption, etc. SATURDAY 23rd MAY: 10am to 6pm, at 27 Clarendon Road, Norwich NR2 2PN. Can you spare a couple of hours or more to help with election canvassing at our next pre-election Action Saturday, only 2 weeks away from polling day? If so, help is needed throughout the day with door-knocking and there is also lots of leafleting to be done. Please come along and support us if you can - to achieve success at both the local county and European elections on June 4th, we need your help to get our message across on the doorstep. A successful campaign would be a huge boost for the General Election campaign too. Refreshments are provided for helpers, including a vegetarian/vegan lunch between 1 and 2pm. We hold a monthly Action Saturday, usually on the second Saturday of every month, which concentrates ordinarily on one ward in the Norwich South constituency. This month, however, we will be working in a number of wards, all of which are important wards for the Green Party in Norwich (in which we either already hold city council seats or have a great chance - with a lot of help and hard work - of breaking through into a new ward). As the June elections fast approach it is therefore important that we do as much door-knocking here as possible, in order to secure the vote - there is lots of support here to build on! Our base for the day in Norwich - 27 Clarendon Road - is just off Unthank Road and a short walk from the city centre. It is also served by the no. 25 bus from Norwich train station. The door-knocking and leafleting sessions start at 10am and 2pm, and it would be helpful if you could arrive at one of these times if possible. You will be given plenty of support and guidance on the day, particularly if you haven't been door-knocking before. For more information, directions, or to offer your help, please e-mailngpvolunteers@yahoo.co.ukor phone (01603) 611909. Emergency number to call on the day if there are any problems or you need help with directions: 07840 040058. PLEASE ALSO GET IN TOUCH IF YOU ARE ABLE TO HELP US OUT ON POLLING DAY ITSELF, THURSDAY JUNE 4TH - THIS REALLY DOES MAKE A BIG IMPACT ON HOW WELL WE PERFORM. It would be great to see you there to help us make the breakthrough in the Eastern region to the European parliament - and also new gains in the local election to ensure a louder Green voice in Norwich and Norfolk. Green Party activists donned hard hats while campaigning in Norwich yesterday. Euro and county council candidates were out in force at the Haymarket to promote their manifesto pledge for a “Green new deal” to boost eco-jobs, renewable energy, and locally sourced food and businesses. Last night the party also unveiled a “clean campaign pledge” and proposals to reform the expenses system. Rupert Read, the party's lead candidate in the European elections, said he was encouraged by polls showing a third of voters in the region are considering supporting the party on June 4. “What people are saying to us across the region is that it's time for change and they are definitely NOT voting for the three main parties,” he said. Andrew Boswell, who is campaigning for re-election the county council said the party was on course to boost its numbers at County Hall. “I'm confident that the Green Party will become a significant force at the county council,” he said. have coherent policies facing Britain today. abandoned Labour outside of the Northern heartlands. Peterborough & Fenland Green Party is delighted to congratulate a Peterborough charity which has been shortlisted for The Observer Ethical Awards (Conservation category). It is excellent that people doing hard work based on high principles are recognised. It is brilliant that Peterborough is home to an outstanding conservation campaign. Buglife campaigned to save a site in the West Thurrock Marshes from major development. This was a really tough campaign: no opportunities for heroics on high seas, no lovely cuddly pandas, no fabulous views of outstanding natural beauty. This was a campaign to save a patch of overgrown brownfield land, which had been neglected for so long that nature had returned to it and installed tiny populations of her rarest and most threatened invertebrates there. This was a campaign which suffered setbacks, but carried on. Invertebrates are the insects, the spiders and the weird little blobs of life which we scarcely notice, but which are by far the most numerous category of animals. Scientists have only put a name to some of them. Many, especially those living in the sea, we haven't even spotted yet, let alone identified or named. Many of them do things we know nothing about, some help mitigate climate change, as they grow their skeletons and shells. We know a bit more about the many invertebrates which help plants to reproduce and grow the seeds and fruit we take for granted. Most people are aware now that bees are in decline. We are now worrying about how some of our key crops will fare if the decline of our bee populations continues. Our own lives and the survival of our children are dependent on our environment and its health. We cannot afford to forget this. Buglife works for creatures whose importance we would be foolish to ignore. Buglife’s fight to protect species in the Thurrock Marshes exposed the weakness of recent legislation passed to protect our biodiversity. A law which proves too weak must be rewritten. It is noticeable that it is European targets for biodiversity which are leading the way in protecting species and the environments they depend upon. Our environment is common to everyone on earth and to every living thing. But while we have national governments which don’t have the will to protect their own biodiversity, we will need organisations like the EU which are able to act at supra-national level. Rupert Read, lead Green MEP candiate for the Euro elections on June 4th says "A generation ago, the E.U. took highly-effective action against the menace of acid rain. Now, the E.U. has begun to take action against the [much-graver] menace of manmade climate change. It is easy to criticise the EU but it is essential that there are bodies that can take effective action on truly international issues. The E.U., for all its faults, is one influential such body. It is clear that EU targets on biodiversity are helpful if only because they provide a standard we can compare with what is and what isn’t achieved at national level." The Green Party fully supports the work of Buglife but recognises that changes in the law may be required to protect our valuable environment better. If you would like to help see these changes come about Vote Green at the Euro and County elections on 4th June. Join the Green Party and help create a new world and a better future for all of us! 1. 2. 3. Rupert's Read: May 2009 4. 12. 15. 18. 19.